It is that time of year. Every commercial is carefully studied. Every sale flyer that comes in the mail is combed over to make sure there isn’t something missed. The lists are made, then remade, and then added to every day up until Christmas Eve when they go to bed at night hoping that they didn’t miss anything and dreaming about what exactly will be under the tree when they wake up in the morning. This year of course is no different. Miss Stalin at only 2 years old is easy. Anything having to do with babies or Minne Mouse and she is a happy, happy girl. Genghis on the other hand, at almost 8 years old, has a list a mile long and it just keeps growing. 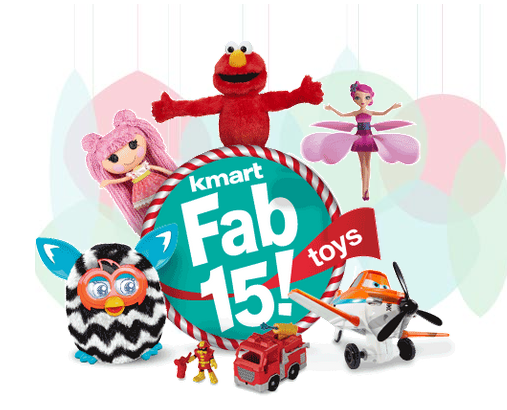 But many of the things on his list can be found with one stop by shopping the Kmart Fab 15. We received the LeapPad Ultra Tablet for a review and to be honest I am not sure which kid will love it more. The ultimate learning tablet! Built from the inside out just for kids, LeapPad™ Ultra features Wi-Fi with kid-safe Web and access to LeapFrog’s educator-approved library of apps, games and more. Features LeapPad Ultra is built from the ground up to be ultra-tough for kids and includes 11 apps (onboard and downloadable), 8GB of storage and a built-in rechargeable battery so the learning fun never ends! Play, draw and write on a 7” hi-res screen designed to respond to a kid’s touch or stylus play. Take pictures and videos with front-and-back cameras. Add cool effects with Photo Fun Ultra, create colorful masterpieces with the enhanced Art Studio Ultra app, and listen to music with the built-in MP3 player. With new peer to peer games, your kids can safely play with friends using virtual pets or LeapFrog characters. Pet Chat allows kids to safely ‘text’ over a local connection with safe pre-defined chat phrases and emoticons with fun sounds. With LeapSearch™, powered by Zui™, kids can explore Web content in a safe environment. And it’s simple to take charge of their online experience with parental settings. LeapPad Ultra works with LeapFrog’s library of 800+ educator-approved apps, games, eBooks, videos, music and more. * Learning games draw from 2,600 skills and select games auto-level, adapting to your child’s pace in subjects like reading, writing and mathematics. Play with game cartridges or download apps directly to the tablet from the Wi-Fi enabled LeapFrog App Center. Connect to the LeapFrog Learning Path to see details of your child’s play and gather ideas to support the learning. I was able to create a separate account for each child. From the home screen they will simply select their name and they will then find all the age appropriate apps that I have loaded for them. I also love that it works with other game cartridges or you can download new apps directly to the tablet. Connecting to Wi-Fi is easy and while I did notice that the actual tablet is a little slow downloading new apps, I am not sure if that is on the tablet end or because of my horrible internet service. You are able to also set up a parent code that has to be entered before viewing any settings. This ensures that they are not downloading anything or even viewing anything without permission. It also makes sure that none of the settings are changed. The apps themselves are age appropriate. By setting up a different profile for each child I can make sure they are both playing with age appropriate apps that are not going to be too hard or difficult for them. Unique this year is a Shop Your Way Charity Gift Registry – Kmart partnered with Share Our Strength’s No Kid Hungry campaign to allow members and gift-givers the opportunity to donate Fab 15 toys to children in need at www.shopyourway.com/giftregistry. 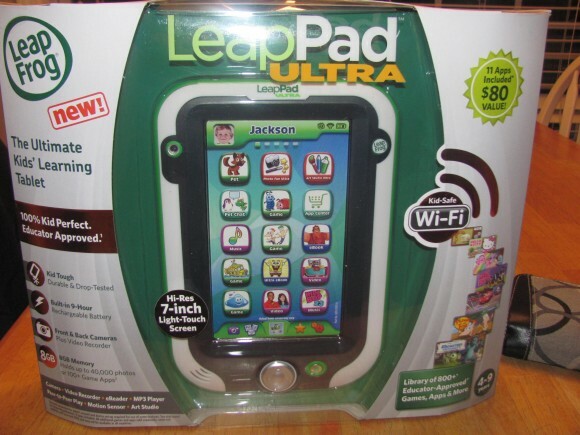 One lucky reader will win a LeapPad Ultra Tablet just like I received. Use the simple form below to enter. And good luck!